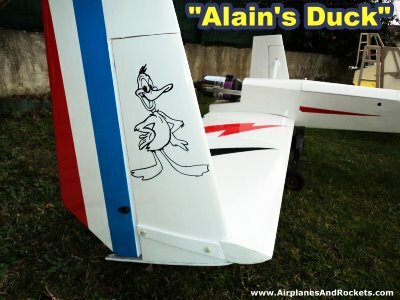 Custom R/C Canard Model Airplane by Alain Pons - "Alain's Duck"
Alain's original "Alain's Duck" model. 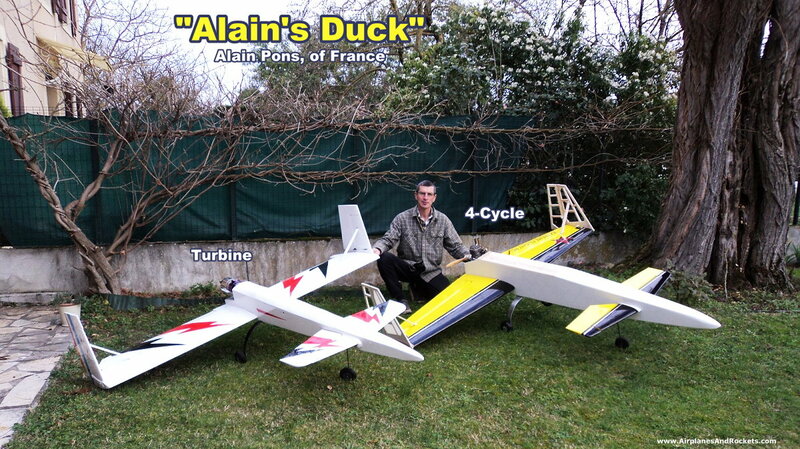 Alain with giant size turbine and 4-cycle powered versions of "Alain's Duck." Check out that braided tree against the wall! 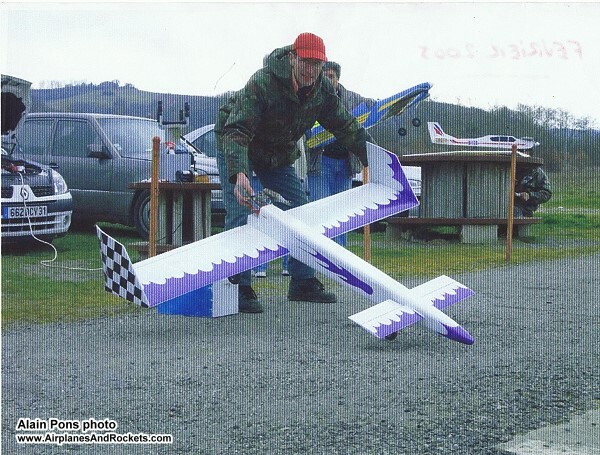 Website visitor Alain Pons, of France, wrote with this great information on his decades-long involvement with designing, building, and flying radio controlled canard model airplanes. Alain graciously agreed to allow me to post his story, photo, and video. See update below. You might want to read through this American Aircraft Modeler article titled, "Canard Design Pointers." Not being content to have built a giant size version of his "Alain's Duck," he just sent me these photos of the turbine jet-powered version of a variant of the original canard. What's next - a full-size homebuilt airplane with Alain at the controls? I hope all is good for you in the beginning of this year. The canard jet has not yet flown today. The beautiful weather is coming and I'll send you the video as soon as possible. When I have fit the turbine on the canard (flying with the 55 cc). A friend of mine gave me the wings and the stab of his new crashed Yak 54 (2,30 m). With the pencil and the paper in the hand, I have drawn a new model. This new canard has been built quickly. I had only to build the fuselage and the fins. Easy. And the first flight is a success. The fuselage is bigger than the first one in order to connect up smoke pump. Marvelous! When I have the video, you will receive it quickly. Here you are the photos of my poultry*. * Not a French to English error - he's referring to his "Duck!" 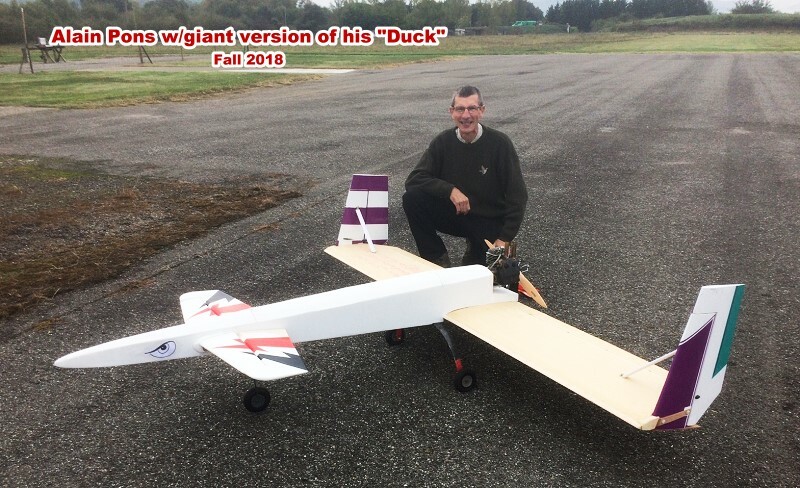 As was probably inevitable, Alain has built and flown a giant version of his "Alain's Duck" canard. Specifics on wingspan of powerplant have not been provided yet, but he did send this photo. It doesn't stop there, though. An R/C turbine version is nearly ready for flight. See the "Big Canard" maiden flight video below. 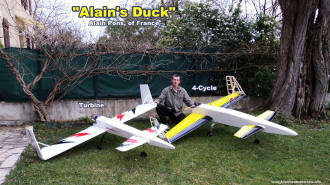 Alain mailed me his plans for his custom-designed "Alain's Duck" R/C canard model all the way from France (see below). The original wingspan is about 71", but you can scale the plans to fit your needs. If you build a Duck, please let me know and send along a photo for posting. Very happy to know you are interested of my work on my canards. I think I am an old dinosaur in aeromodelism. I was born in 1953 and began to glue balsa when I was 10 years old, following my father in free flight, fly by wire and later R/C. And now jets and war birds with big radial engines . Today very few modelists in my country are building their own models .It is the era of the "ready to fly." Beginning quickly often means "ready to crash..."
The pleasure to study, build and try his own plane has disappeared, alas. The canard on the video (see below) has flown more than 15 years. I offered it to a very good friend of mine, but the model ended its life due to a switch failure last year. It flew full throttle vertical to the ground. A beautiful explosion - Sob! All wooden construction (balsa , plywood, spruce). Airfoil: Foil :NACA 0012 (stab NACA 008) -thin enough for a good speed and good aerobatic features. Engine: An old .61 Webra speed with a 11x8 prop (pusher) .This engine has flown on an antic "enforcer" during more than 25 years. All the plane is squared. Very easy to build:4 sheets of balsa wood for the fuselage . No sweepback, and no dihedral for the wing. The several ribs of the wing are all the same - easy to cut . The large fins are made with 8 mm balsa wood and stuck on each side of the wing. For the landing gear: Piano wire (4mm) and a classic nose wheel. The tank is, of course, exactly on the CG. The covering: Diacov for the wing and paper painted for the fuselage and stab. You need 6 servos - 1 for the throttle (Futaba 3001 for example), 2 for ailerons, 2 for the rudders (tiny MPX or Hitec hs 81), 1 for the nose wheel. A 4/6 channel radio. A 5 cell 3300 mAh NiMH in the nose for the balance. The flight is easy but do not forget that the engine is pusher .The fins are not blown by the wind of the prop. It flies like a jet and it is a good trainer before flying a jet . Now I am going to draw the plan on my computer(not very easy for me) in order to send it in my next mail. You will post your article for your friends. Today, I am building a new canard on the same design ,but slightly bigger. I have saved several parts of planes crashed on my club: two stabs (one from an extra 300 -2,30m and an other one from an Sbach of the same size ), a landing gear with wheels. I studied the model with these spares .The fuselage has been built in plywood (4 mm) and the wing in foam covered with a sheet of same (0,8 mm) glued with PU glue and a vacuum pump . For the power, a 55 cc with a pusher prop (20x10). If the flight is perfect (like the last canard on the video), this engine will be replaced by a turbine (8 kg thrust). I hope so . The plans do not show details for construction the canard stabilizer and elevator. Per Alain: The airfoil is a constant cord NACA 008). Two sheets of balsa are bent on a rod of samba. The elevator is perfectly rectangular with a 64 (25.2 in) cm span and a 17.5 cm (6.9 in) chord with12 cm (4.7 in) for the fixed part and 5.5 cm (2.2 in) for the elevator. Send me an e-mail if you would like a full-size PDF version that has not been cleaned up to remove the original paper fold lines and has not had the contrast enhanced. The file size is 18 MBytes, so your e-mail server will need to be able to accept that size file attachment.